In 1695, Joseph Addison secured political patronage and a diplomatic travel mission by doing none other than penning a poem with the simple title, "A Poem to His Majesty." Addison dedicated it to a prominent Whig politician—John Somers—and thus won a step up in politics. Fast-forward to 2013 and, if Facebook privacy settings allowed, you would see what I saw: a prom invitation to a young woman: "The prom is dumb. Come with me. We'll have fun." How could she resist, she typed coyly, and the date was apparently set. Because poetry carries intent, especially when gifted from person to person, the power of a poem can be surprising indeed. While it may eventually have broader appeal and provoke diverse interpretations (though perhaps not in the case of our Facebook poem), its effect on the individual can change the course of a relationship, even the trajectory of a life. Such is the case, according to Matthew Hollis, with one of the most famous American poems: "The Road Not Taken." Within this single poem is a whole relationship, and the way that relationship unfolded for Edward Thomas and Robert Frost. 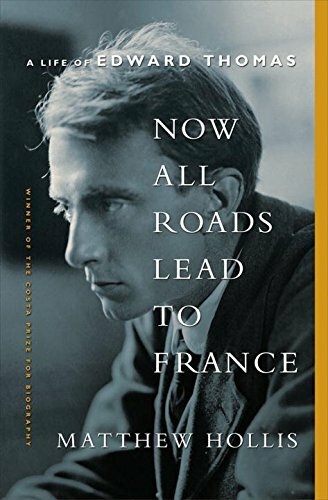 Now All Roads Lead to France: A Life of Edward Thomas uncovers the secrets of Frost's poem, through what at first appears to be a straightforward biography of Thomas but turns out to be an extended reflection on poetry and this poem in particular. Edward Thomas (1878-1917) scraped out a living for himself and his family as a prolific reviewer, essayist, and literary jack-of-all-trades. A contemporary of Eliot, Pound, Brooke, and Owen, Thomas was himself a poet at heart. Robert Frost knew this early on and encouraged his friend's latent ambition much as Thomas promoted Frost's professional success. Frost would later say Thomas was "the only brother I ever had."